Some of us remember how there were reading and math coaches hired in every NYC public elementary school in the first phase of Children's First under Chancellor Joel Klein. It led to little or no improvement in achievement, according to the NAEPs. The initiative relies on a vast infrastructure of reading coaches and other supports. Just under $22 million of the new funding will pay for staff, including new coaches, more targeted supports in high-needs schools, and higher salaries for coaches in order to attract new staff. Of the $30 million investment, $8.6 million will be used to cover new programming, including training for reading coaches, interventions for students who are struggling with reading basics, more after-school reading programs for students living in homeless shelters, training for teachers and superintendents to support coaches, and a new online platform designed to give parents more information about their child's reading progress. Was there any analysis of the efficacy of literacy and math coaches under Children's First? Has there been any analysis of the impact of the 103 literacy coaches the DOE hired for Districts 17 and 32 schools in Brooklyn, and Districts 9 and 10 in the Bronx starting in 2016-2017 school year— which supposedly expanded to another 14 districts the following year? Did this show any results? The hiring was already supposedly expanded to 800 schools this year -- what are the results so far? and how much are we already spending on this initiative? By fall 2018, the city plans to have a so-called universal literacy coach in each of the roughly 800 elementary schools, at an annual cost of $75 million. Education department officials said it was hard to find candidates up to the task, though five teachers applied for each spot. The coaches get professional development for three weeks in the summer and twice monthly after that. As in the previous attempt to improve results by adding "coaches," this initiative will also likely be ineffectual without a concurrent sharp decrease in class sizes in the early grades. $100 million would buy at least 1000 teachers to reduce class size, a reform with proven results. I also wonder about this "new online platform designed to give parents more information about their child's reading progress" as described above. How much will it cost, how reliable will it be and what's the evidence for this idea --given how little the online platform ARIS was used by teachers or parents and what a costly boondoggle it turned out to be. The vast infrastructure described above also reminds one of the increased bureaucracy and professional development systems created for the wrongheaded Renewal school program -- also costing about $100 million per year, with little or no improvement in class size and disappointing results. Will these millions go down the drain as well? Correction: Just read in this NYT editorial criticizing de Blasio's disgraceful comments on the tiny number of only seven substantiated teacher sexual harassment complaints over four years that it was Yoav Gonen of the NYP that asked the question-- not Jill Jorgensen of the Daily News. And apparently the number of actual complaints was 570- not 471, as the city first reported. What an awful day it was yesterday. It started with the Mayor and the City Council holding a joint press conference, touting a budget deal to bring all schools next year up to 90% of their Fair Student Funding amount -- which is a good thing, but not cause for a huge celebration when they're still not fully funded. "There has been a history, it's pretty well-known inside the education world, of some people bringing complaints of one type or another for reasons that may not have to do with the specific issue — and this is not just about sexual harassment it's about a whole host of potential infractions...It is a known fact that unfortunately there's been a bit of a hyper-complaint dynamic, sometimes for the wrong reasons. I think that has inflated the numbers." Why the DOE, unlike any other city agency, would foster such unwarranted complaints he added, "I'm just saying it's a reality. I can't give you the sociological reasons. I am saying it is a reality we have to address." Really? Only 471 complaints over the last four years itself seems quite low given the fact that there are more than 135,000 DOE employees -- the largest by far of any city agency. Instead, the more likely explanation for the low number of allegations and the even smaller number of substantiated complaints is the well-documented chronic dysfunction and corruption at the DOE internal investigative office, the OSI, staffed by agents who drag their feet, whitewash, or retaliate against teacher whistleblowers when they attempt to expose misdeeds of their superiors. One recalls how the Mayor repeatedly dismissed the well-founded allegations of Dewey HS teachers who, for many months, provided ample evidence to DOE and the Chancellor of the grade-fixing scandal engineered by their principal. This was eventually admitted by DOE, but only after more than a year of stories by Juan Gonzalez of the Daily News, Sue Edelman of the NY Post and Marcia Kramer of CBS-- and after hundreds of Dewey students had already graduated with fake credits. In fact, Dewey principal Kathleen Elvin used the fact that the Chancellor had allowed these students to graduate to keep a well-paying position at DOE after she was fired from the school. 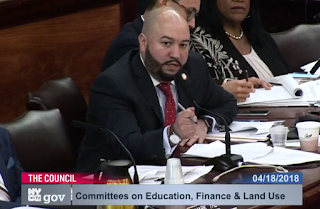 "NYCDOE must be accountable for ensuring make-up and credit recovery programs in all its schools are properly administered and provide the education students need to succeed in life. Anything short of that is a disservice to students. ...Your response to our audit indicates that NYCDOE does not recognize or appreciate the seriousness of the audit findings. 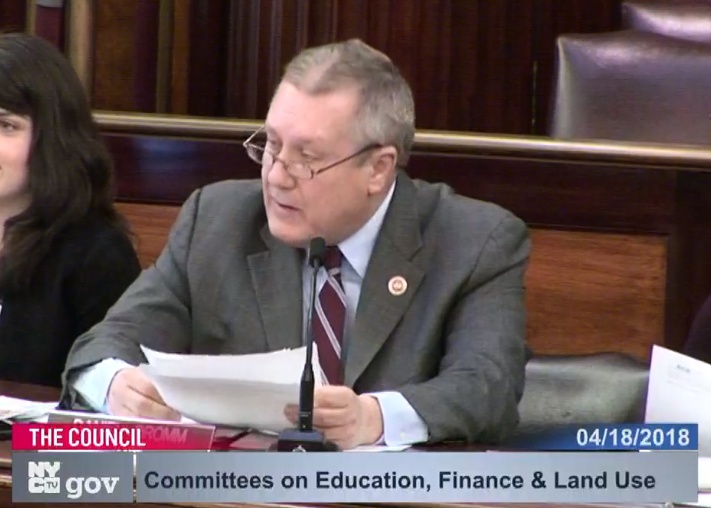 NYCDOE must address the findings of this audit and immediately start work on implementing its recommendations so no more students are cheated out of the education they deserve." Then last evening the Panel for Educational Policy met at Murry Bergtraum HS, the first with the new Chancellor Carranza. It started with typical DOE dysfunction, with hundreds of students, teachers, and parents standing in an incredibly slow line to sign up to speak, with two pairs of DOE employees assigned to take each of their names. Each speaker was asked to spell out his or her name, while one DOE staffer then recited the name to another staffer, who slowly entered the names into laptops. When the meeting started at about 6:15 PM, Chancellor Carranza repeated the news that the increase in Fair Student Funding to 90% - though not the Mayor's controversial comments about the "culture of complaint" at DOE. The proceedings went on till past midnight, with one student after another begging the DOE to keep their schools open or being saved from being merged and squeezed into less space. The crisis of overcrowding was a theme repeated again and again during the night, starting with a vote on school capital plan. Three advocates spoke from the audience, asking for more schools to be retrofitted to allow access for disabled students, with far too many students severely restricted in choices for elementary, middle and high school. 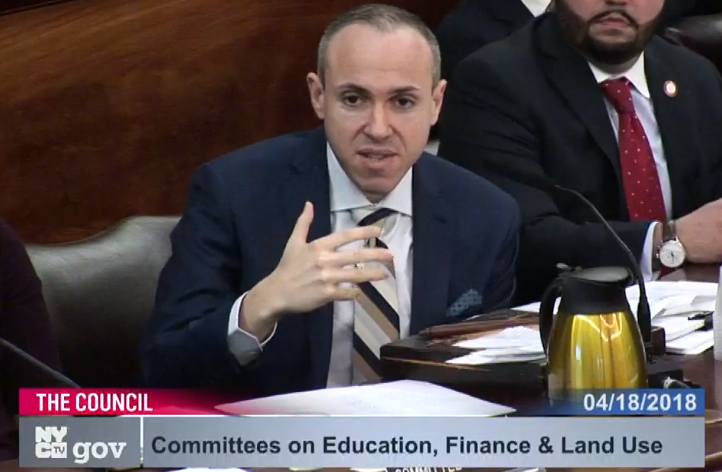 I spoke and welcomed the new Chancellor, and then pointed out how more than 570,000 students are crammed into extremely overcrowded schools, and yet the capital plan is less than half funded to address the need, according to the DOE's admission. And we know the need is even greater than the DOE admits, in part because the school capacity formula is not aligned with smaller classes, which are necessary if our schools are going to improve. I cited the sharp increases in class size, and the lagging NAEP scores which reveal that, despite the Mayor's claims, achievement hasn't budged in four years, except for a decline in 4th grade math. I reported on our recently filed lawsuit, demanding that NYC comply with the law and reduce class size. After only about five minutes of discussion focused on the disability access issue, the capital plan was approved 10-2 , with Geneal Chacon, the Bronx Borough President appointee, and Lori Podvesker, a mayoral appointee and a disability advocate, voting against it. The PEP went on to unanimously approve millions of dollars in vendor contracts, without any discussion (they have never voted down a contract despite many excessive and even corrupt ones). They also unanimously approved without a single comment the controversial fair student funding weights, with many schools still receiving less than 100% of their fair share and more funding allocated to middle school students than those attending elementary or high schools. Then the meat of the evening occurred. 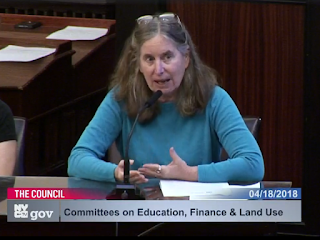 There were 27 controversial changes in school utilization on the agenda, with many schools proposed for closure, merger, resiting, and thousands of students lives disrupted and treated like widgets -- in many cases to make room for rapidly expanding charter schools. These schools have been prioritized under this administration nearly as much as during the last one, despite de Blasio's campaign promises to put our public schools first -- and not to close any schools except as a last resort. Eduardo Hernandez from CEC8 spoke, and pointed out that the merger of Rucker HS and Longwood Prep, two struggling Renewal schools, didn't address the problem of insufficient resources, or their overcrowded conditions with the building at 114% capacity and Success charter school taking 60% of the space. Once you approve this, he warned, it will hurt their students and crowd them even more in-- as Success continues to expand. He also said that the protests and chanting that had already erupted were the direct result of the lack of meaningful parent and community engagement, with rushed DOE hearings that are scheduled after their decisions have already been made. As he rightly concluded, the entire process is rigged. The two most controversial proposals involved the closure of Crotona Academy High School, a Bronx transfer school enrolling high-risk, overage and under-credited students, many of whom had already attended two or more high schools previously, and the merger of two transfer schools in Brooklyn, Bedford Stuyvesant Preparatory High School and Brooklyn Academy High School. There were many Crotona Academy High School students at the meeting, all of them opposed to the closure. Students spoke about their experiences at their other high schools, where large class sizes and overcrowding led to them being unable to form meaningful connections with their teachers. For hours, students pleaded with the Chancellor and PEP members to keep the school open, including giving a musical performance. One parent said she was a DOE teacher, but she couldn't help her two children who had dropped out of their previous schools -- but Crotona did. The teachers explained that the data the DOE used to justify the closing of the school was out-of-date; later the Superintendent admitted to PEP members that he didn't have access to the latest data but he insisted the school should be closed anyway. Crotona Academy has been a school in "good standing" by the New York State Education Department for the last five years. Closing a school is always disruptive for students, but it is particularly damaging for transfer students, whose self-confidence is exceedingly fragile. One student warned of an increase in street violence if the school closed. Yet the PEP approved the school's closure by a vote of 7-5, with every mayoral appointee voting for closure and the five borough president appointees voting to keep the school open. Advocates say they will sue the DOE for violating federal law. The merger of Bedford-Stuyvesant HS and Brooklyn Academy HS also drew intense and passionate opposition. The merger is part of a plan to bring Uncommon Brooklyn East Middle school Charter , into the building, and give most of the building's floors to Uncommon, which already operates a high school there. Uncommon has among the highest reported suspension rates of any of the charter schools in the city, but for some reason it is a favorite of former Chancellor Farina anyway who granted it special privileges even when this undermined the education of public school students. Uncommon had to move from its current location, co-located in the building of PS 9, which is hugely overcrowded,at 117%, with enrollment having grown 28% since 2012-2013 school year. Yet the the DOE acknowledged that the intrusion of Uncommon into the new building would also result in overcrowding; by the 2021-2022 school year, the building is projected to have a utilization rate of 96%-104%. As a result, the merged transfer schools will lose an entire floor of the building to Uncommon . In addition, PS K373, a co-located District 75 school, will be assigned a classroom with only 240 square feet for its 12:1:1 program. This violates state guidelines, which call for at least 770 square feet for 12:1:1 classes. Neither Bedford-Stuyvesant HS nor Brooklyn Academy HS is poorly performing. Their graduation rates are at the 93rd and 88th percentiles for transfer schools, making them among the top transfer schools in the city. Merging the two schools will cause them to lose intervention rooms, counseling rooms, and classrooms, lead to teachers and counselors being excessed, and undermine the amazing progress made by their students, which should be celebrated and supported rather than undermined. Several representatives of elected officials pointed out that all the proposed co-locations and charter expansions merely made overcrowding worse. Senator Velmanette Montgomery's representative urged the panel not to allow the success of one group of students to be sacrificed for the sake of another - and not to eliminate the space for small classes at the transfer schools but to find an alternative site for Uncommon charters. One after another, students eloquently pleaded with the Chancellor and the members of the PEP, explaining how in their previous high schools, the overcrowding had been too intense, with class sizes of thirty or more causing them anxiety and depression. One girl said about her experience in her previous high schools, "I felt like a nobody, now I feel like I'm somebody - don't take that away. If you do, I'm giving up. " Again, in heartless fashion, the mayoral appointees were unmoved, and the merger was approved by a vote of 7-5. The PEP voted to merge six other schools: Holcombe L. Rucker, Longwood Preparatory Academy, East Flatbush Community Research School, the Middle School of Marketing and Legal Studies, Aspirations Diploma Plus High School, and W.E.B. Du Bois Academic High School. The first three are struggling Renewal schools, and the last two are transfer high schools. It was a tragic night for nearly all concerned. I would urge people to watch the video of the proceedings, but typically, the most recent video posted on the DOE website is of the February PEP meeting -- two months behind. Perhaps Norm Scott will post his video soon. I recall what Deputy Chancellor Elizabeth Rose said at the NYC Council hearings last week-- that overcrowding did not harm the quality of education afforded students-- and yet here were our most vulnerable students, one after another, revealing how overcrowding had undermined both their learning and mental health, and warned how this would happen again as they were squeezed into less space. Celia Green, acting President of the Citywide Council on High Schools, is an amazing special education advocate and mother of six boys, including four on the autism spectrum. A video in which she was interviewed last year was used by the Mayor to campaign for continued mayoral control. Last night she told me that mayoral control was the worst thing that ever happened to NYC schools. Check out today's interview with CEC District 6 President Johanna Garcia on the Brian Lehrer Show. Johanna did a great job of explaining why students should opt out of these unreliable exams and the negative impact of high-stakes testing on our schools and the quality of education in a debate with Richard Buery, former Deputy Mayor under de Blasio and now chief of public affairs at KIPP charter schools. Please listen to the entire segment -- but for a quick recap, my tweets are below. Rarely do real-life parents or education advocates get on this show, let's hope that Brian will do this more often in the future. Save the date! NYSED wants to hear from parents on student privacy starting May 2! As many of you may remember, our fight against NY state sharing loads of personal student data with a Gates-funded corporation called inBloom Inc. aroused much concern among parents. This concern led to the passage of new NY student privacy law in March 2014. One part of the law blocked inBloom , which closed its doors shortly after, and the other part of the law had a number of other provisions to help protect and secure personal student data, most of which have not yet been implemented or enforced. The best thing about the legislation is that it included a Parent Bill of Rights, that was supposed to be expanded through the input of parents and other stakeholders. We have been pressing the NY State Education Department to reach out to parents to ask them what the Parent Bill of Rights should include, and how the law should be strengthened and enforced. They are finally doing this. In a series of forums beginning on Wednesday May 2 in West Seneca NY and ending on June 18 in Queens, parents will have the opportunity to express their concerns to NYSED and its chief privacy officer, Tope Akinyemi, about the ways in which their children's personal data is being collected by schools and districts, and shared with a variety of vendors and other third parties, often without their knowledge or consent. Districts, schools and classrooms across the state are doing very different things with student data, without much oversight, but all of them are collecting more and more of it, and sharing it with the state, leading to an increasing numbers of breaches and other instances where the data has been misused for commercial or other non-educational purposes. Here is a list of the personal data elements that the state currently collects from districts and schools, including their suspension, attendance and disability records, whether they have been determined to be homeless, neglected or delinquent, and their date of entry to the United States (which could be used as a proxy to immigrant status). It was also recently reported that Pearson has done experiments on students in one of their instructional software programs, by embedding different "messages" to see how this affected their scores, without their knowledge or consent. To this day, we would never have known about this experiment if Pearson hadn't reported on the results at a recent educational research conference. The company says they were doing this to improve their products and/or develop new ones-- which is clearly a commercial use but even so, is allowed in many contracts and in many state laws. The New York state law bans the commercial use of data, but doesn't define what that means, so that this one of the areas that needs to be clarified and addressed. We will be providing a list of possible talking points soon, but I wanted to alert you to these important forums so you can save the date and plan to attend. See the schedule below. You can also email your comments and suggestions on this issue to NYSED from May 2- June 18 to PrivacyForumComment@nysed.gov If you can, please copy me at info@studentprivacymatters.org as I'd like to hear your concerns as well. Thanks!